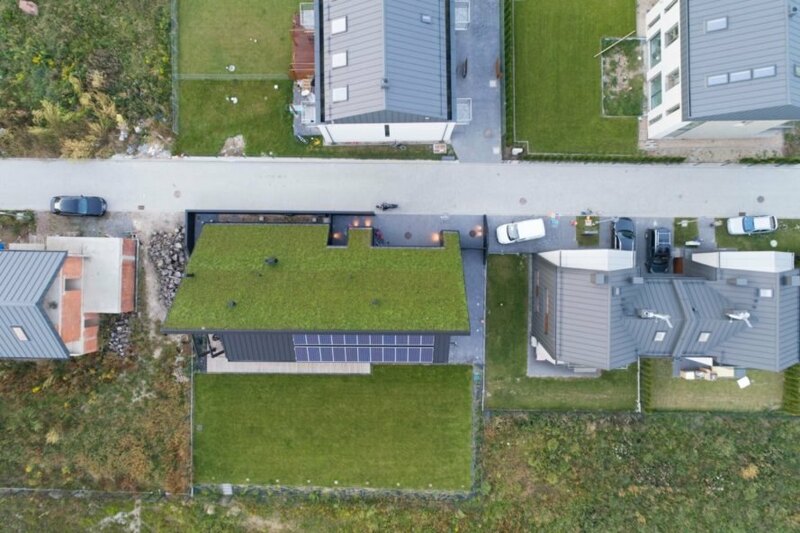 We often profess our love of green roofs, but a recent home design in Krakow has really taken the idea to the next level. 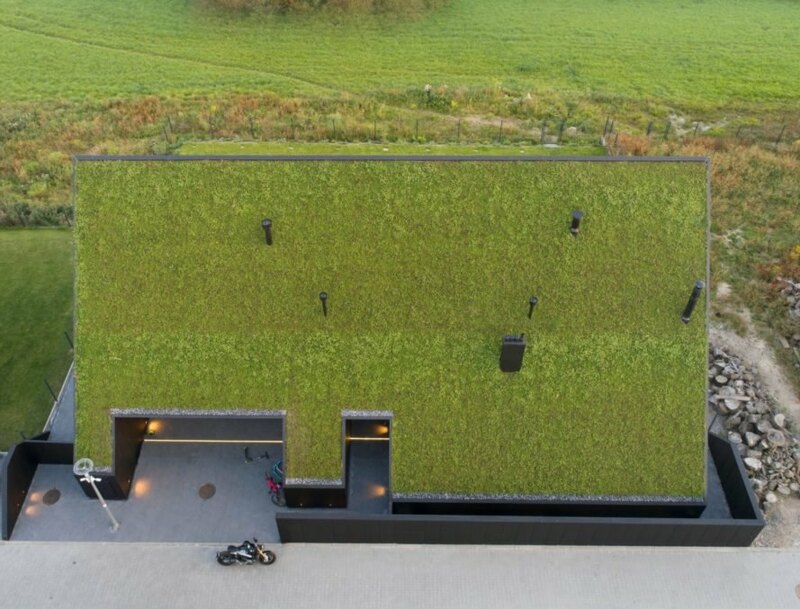 Polish firm Superhelix Pracownia Projektowa has just unveiled a beautiful home with an enormous green roof that’s sloped over the entire northern side of the home. 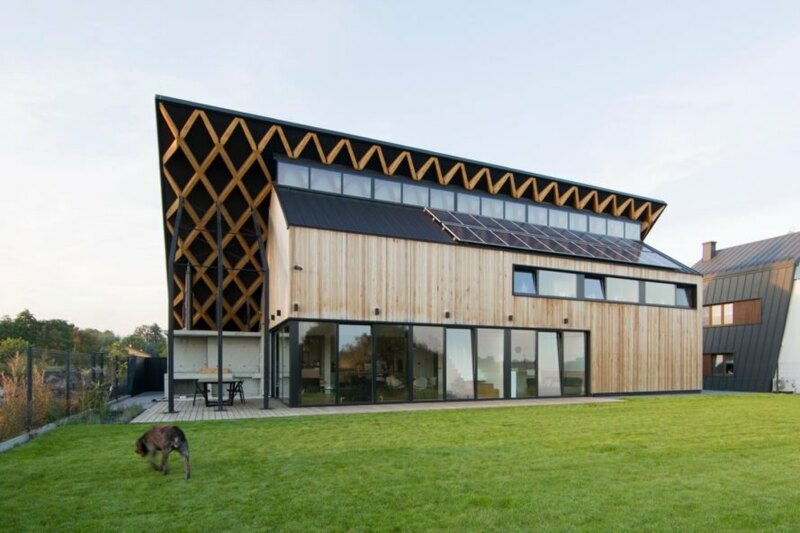 The roof is so large that it camouflages the barn-inspired home entirely on one side, providing the home with its name, the House Behind the Roof. 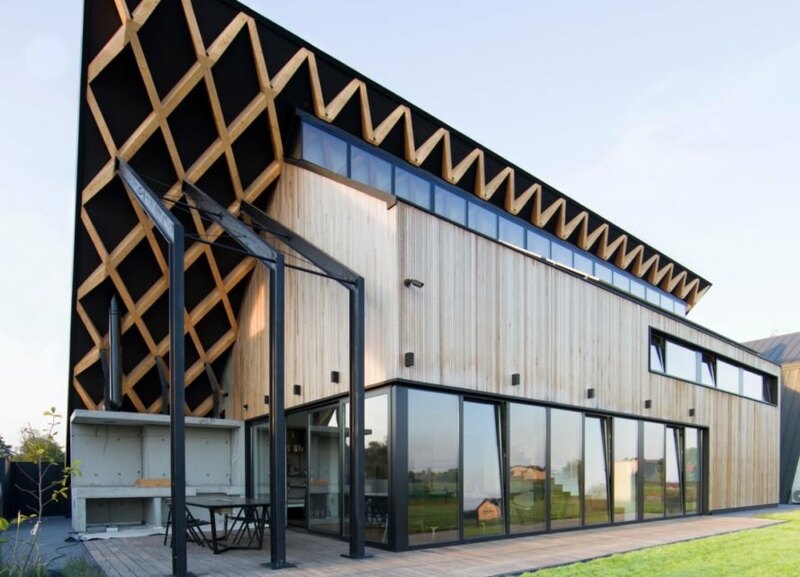 The 2,000-square-foot home is located in a residential area outside Krakow. The building is part of a housing estate with 10 other homes built relatively close together. According to the architects, the first stages of the planning were focused on ensuring the privacy of the homeowners. As a result, the home’s design was created with the immense roof that pulls double duty as an eave that shades the interior while providing the utmost in privacy. Although the architects wanted to go with a traditional, flat green roof, local building codes prohibited them from doing so. As an alternative, the architects decided to top the home with a 45-degree sloped plane on the northern side. Covered with lush succulents, the roof gives a touch of whimsy to the design but also acts as a privacy shade and insulation. On the southern side of the home, multiple solar panels soak up the sun’s energy. At the apex of the A-frame roof, a series of large skylights allow natural light into the home. The house is clad in a light-hued Western Red Cedar. Because of the resilient nature of the wood, it wasn’t necessary to treat the timber beforehand. As a result, the wood will take on a silver-gray patina over time. Additionally, care for the green roof is also minimal. Long-lasting dry periods in this region are not common, and the succulents planted on the roof are low-maintenance. The rustic wooden aesthetic continues throughout the interior of the two-story home. Along with the skylights, there are multiple windows that are mounted high in the walls to provide the interior with natural light and ventilation. 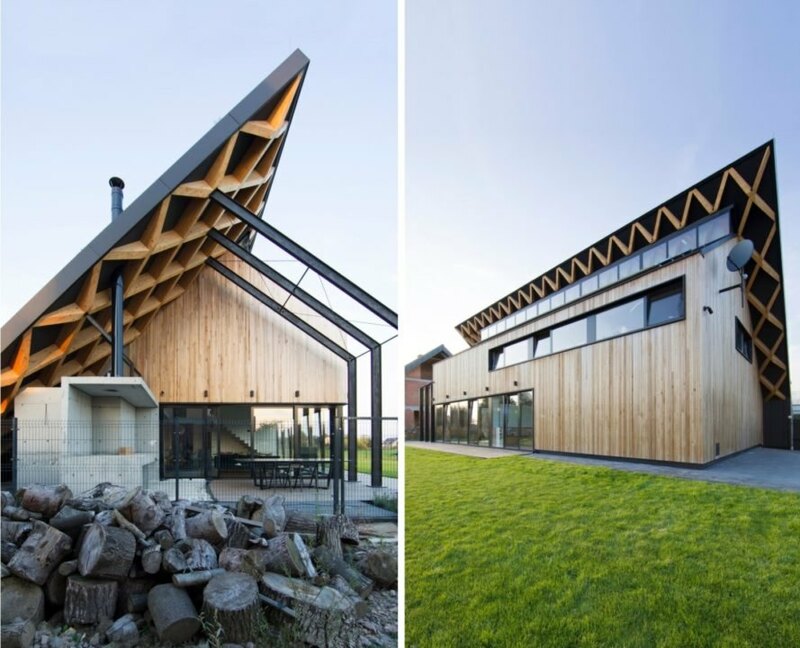 The home is laid out in a rectangular plan, reminiscent of a traditional barn. The ground floor houses the kitchen and living space, along with a bathroom and utility room. The master bedroom and en suite bathroom are on the top floor, as well as two extra bedrooms and a children’s playroom. On the bottom floor, large sliding glass doors lead out to an open-air deck with a barbecue and dining space. 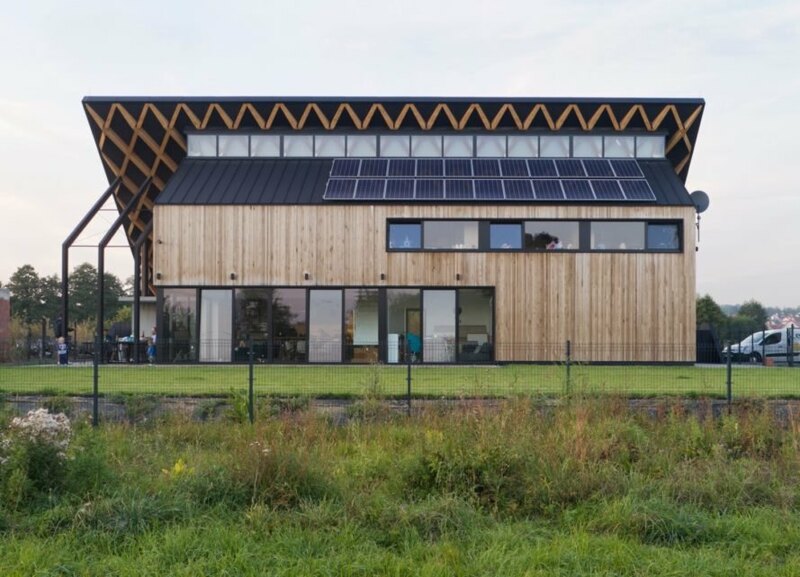 Polish firm Superhelix Pracownia Projektowa is behind the design for the House Behind the Roof. The green roof has a 45-degree slope. The other side of the roof is covered in solar panels. 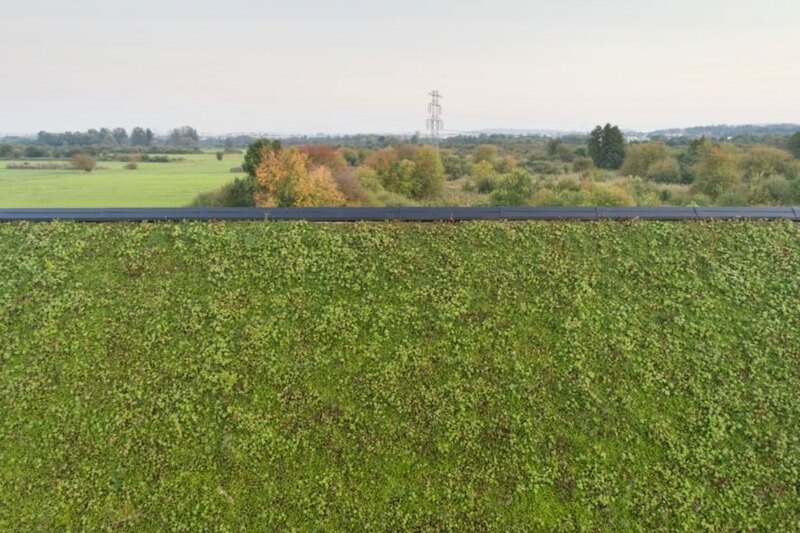 The green roof slopes until it nearly touches the ground. The sloped roof provides privacy to the residents. The home is clad in Western Red Timber. The home design is inspired by traditional barns. The green roof also helps with insulation. The two-story home consists of three bedrooms. The roof is planted with succulents. Diagram for The House Behind the Roof. A series of skylights and windows flood the interior space with natural light.